More than 20 airmen from Dover Air Force Base, Del., packed 3,000 meals for local underprivileged youths at the Food Bank of Delaware June 12. 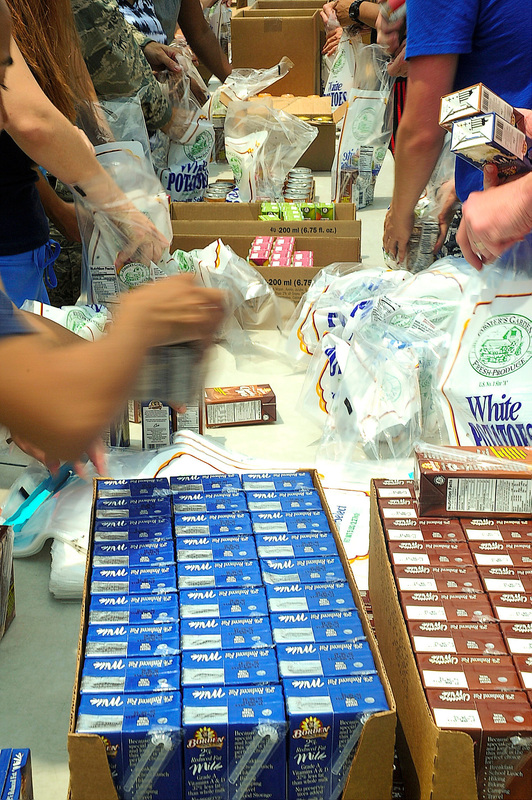 Airmen from Dover Air Force Base, Del., pack meals June 12, 2013, at the Food Bank of Delaware, Milford Branch. (Photo Senior Airman Sam Taylor/Air Force). Senior Airman Samuel Taylor writes that the volunteers partnered with the food bank, which relies solely on volunteerism to aid more than 240,000 food-insecure Delaware residents annually. The meals, consisting of milk, juice, fruit, cereal and microwaveable entrees, are delivered to children whose families often must choose between purchasing food and basic utilities. “We don’t have paid workers, so without volunteers like [the airmen of Dover], this food would not make it into the communities where it’s needed,” said Matthew Brandi, the volunteer coordinator with the Food Bank of Delaware, Milford Branch. Almost too fast; the airmen, whose mission is to deliver cargo around the globe at a moment’s notice, were asked to stop early to leave work for the next volunteer group. At the day’s end, the food was packed and the supplies were stowed with a preciseness that would impress an aerial port squadron commander. Most importantly, thousands of meals were placed in the hands of hungry Delaware recipients, courtesy of the food bank and Team Dover. To volunteer or donate to the Food Bank of Delaware, visit http://www.fbd.org/get-involved/.